First Headmistress’ first term at Grace Dieu! The start of the Spring Term was the start of Mrs Margaret Kewell’s first term as Headmistress at Grace Dieu Manor School. Appointed as Acting Headmistress in the Autumn Term, Mrs Kewell officially took up the role of Headmistress this week. 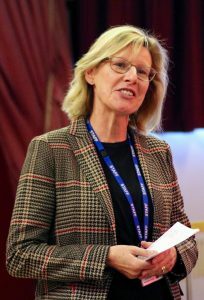 Having previously held the position of Deputy Head for three years, Mrs Kewell’s appointment sees Grace Dieu led by its first female Head in its 84-year history. Mrs Kewell brings extensive experience to her first position of Headship – she has taught in Buenos Aires, Argentina, as well as in the independent sector in both Surrey and then Essex. She holds a Bachelor of Education (Hons) degree specialising in English and History. Her appointment to Headmistress follows an impressive first term leading Grace Dieu, no more so than during the School’s recent inspection, more good news of which will follow!